Set up your app or website on this Windows Surface tablet. 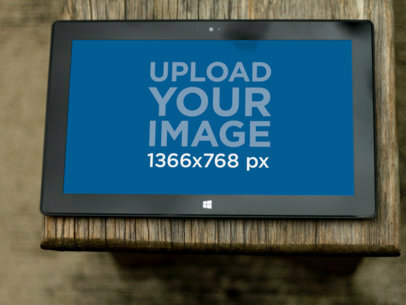 You can showcase an image of 1366x768px on the Windows Surface in landscape view. 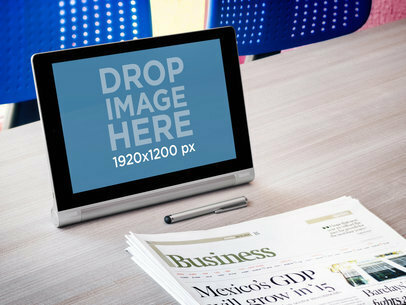 This tablet stock image shows the device propped up against its stand on a white backdrop. The Windows Surface is tilted slightly towards the side left, giving a 3/4 view. 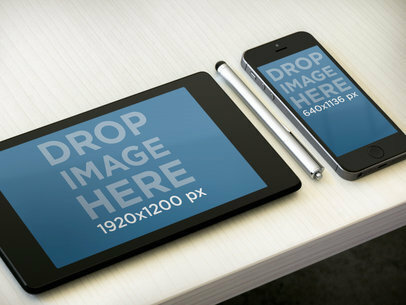 This basic mockup template will work to display any app or website. "Do you have a great new android app or website and want to showcase how fun and easy it is to use? 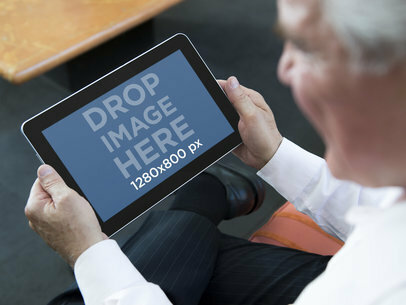 Choose this Placeit Samsung Tablet template featuring an older gentleman enjoying a beautiful spring day with a cup of coffee and your new app or website on a black Samsung Tablet he holds in landscape position. The retired aging baby boomer demographic is one of the Do you have a great new android app or website and want to showcase how fun and easy it is to use? 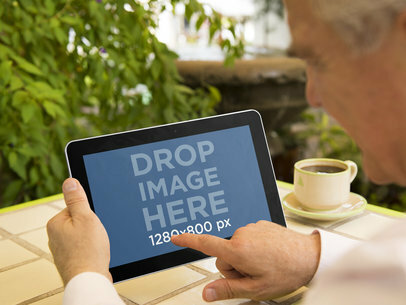 Choose this Placeit Samsung Tablet template featuring an older gentleman enjoying a beautiful spring day with a cup of coffee and your new app or website on a black Samsung Tablet he holds in landscape position. The retired aging baby boomer demographic is one of the largest consumer groups to market your app to and growing. Whether it’s a memory training gaming app you’ve created or a smart investors’ website or health record organizer, this Placeit marketing template will appeal to these elite members of society at a glance. Create a custom mockup now. Just drag and drop a screenshot of your app or website directly onto the screen or type a URL above and Placeit will automatically adjust for you. Market smart with Placeit marketing tools today. Do you find yourself in need of a fun new app marketing tool? Do you have an app or mobile responsive website that aids in productivity? Maybe your site specializes in creating presentations or graphs? Does your website help with creativity or team work? Or do you have a new social or business app that allows people to communicate from around world? If you answered yes to any of these questions, then you need this mockup template from Placeit as part of your marketing strategy. This scene features a young man using his black Lenovo tablet in landscape position. We can notice he is sitting at a creative office table among other coworkers. The main focus of the image is the Lenovo Tablet. The screen is angled just right so you can easily drag a screenshot from your site and turn this mockup into a valuable marketing tool for your app or website. 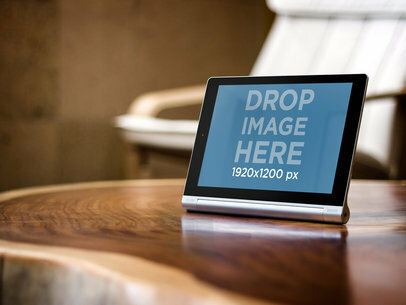 This Microsoft Surface mockup template features a Microsoft Surface tablet laid out on top of an old wooden bench. The bench is outside the house and we’re looking at this tablet directly from a bird’s eye view. 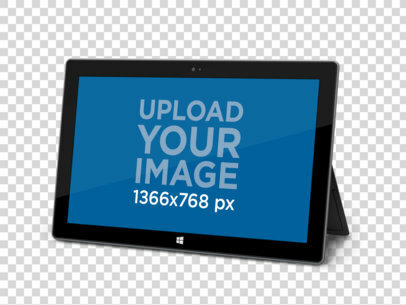 This product mockup would work well for anyone with a Microsoft Surface focused app targeting creative consumers. The colors in this stage are almost entirely brown and the screenshot takes up the majority of the display area. A man in a teal sweater plays with a Samsung Galaxy 4g LTE silver. He is at work, but is taking some minutes off to look at your new app. Use this Samsung Galaxy 4g mockup for your app today! 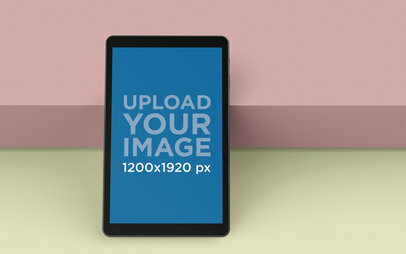 Take a look at this beautiful Android mockup template. This is a workplace scenario in which two grown men are holding a business meeting. This environment is the perfect place for you to display your brand new android app or mobile responsive website if you are going for a professional output. 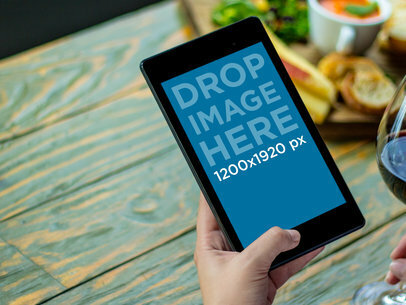 This android stock photo template is featuring a black Nexus 7 Tablet being held by one of these men in landscape position, which allows a large display of your android app. You can use Placeit mockup templates to showcase your app's design and features as a part of your app marketing campaign. Go ahead and try using this template right away, all you have to do is drag and drop your app's screenshot directly into the Nexus 7 screen and Placeit will adjust it for you. If you need a seriously cool vibe to show off your new website or android app then this Placeit Nexus template is the right choice for you. This template features a young lady sitting casually on a spiral wood staircase, holding a black Nexus smart device in a slightly angled portrait position. Clad in a soft floral jersey top and blue jeans she could easily be enjoying your app on a boat or in a beach house. Don’t miss out! This Nexus tablet mock-up template is bright, airy and carefree and perfect to showcase your cool android app or mobile responsive website. The only thing missing in this scene is you so let’s get started: Just drag and drop a screenshot of your app or website directly onto the screen in the template or click on the "Grab Screenshot From URL" button above the photo and type in the URL so Placeit can do it for you. 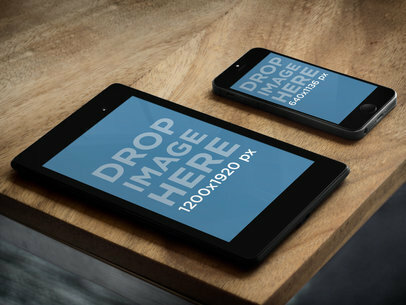 Get custom mockups featuring your app or website quickly and easily. It’s time to market your android app right with Placeit marketing tools. A young man is holding a black windows surface tablet in a landscape position with both hands; he is at a local coffee shop and is probably streaming a video or having a video call with a foreign friend, he could even be using your brand new windows app! Go ahead and use this tablet mockup that features the sleek windows surface to showcase your business and enhance your visual content in a clever manner. 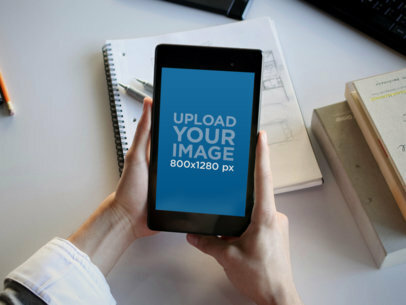 Update your visual marketing campaign by using Placeit's photo mockups to advertise your new app or website in an eye-catching way. 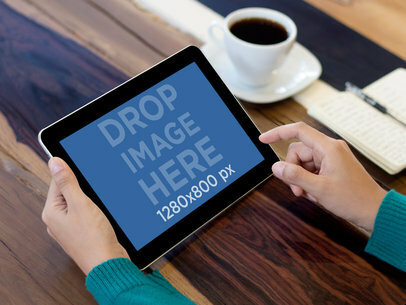 This image features a windows tablet in landscape position on a restaurant table next to a served breakfast plate. 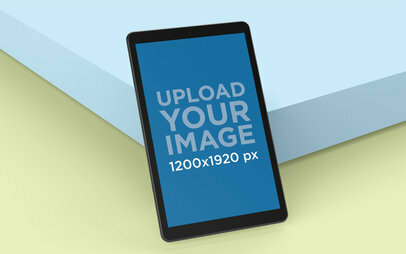 This mockup is great because it will allow you to showcase your ideas in a relatable way to your potential consumers. 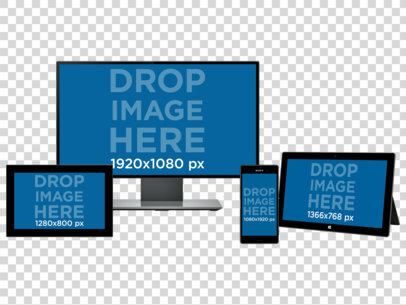 To start using stock photos all you have to do is drag and drop a screenshot of your app or website onto the template or input a URL so Placeit can do it for you. 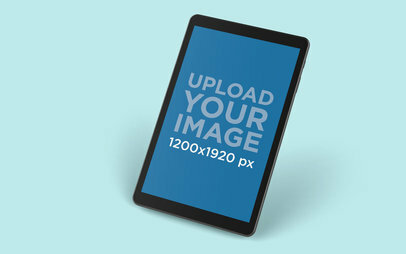 See more Tablet Mockups here! A Lenovo Yoga Tablet stands on a rustic table. In the background, a mysterious white chair. The table the tablet lays on is made of fine, glossy wood. 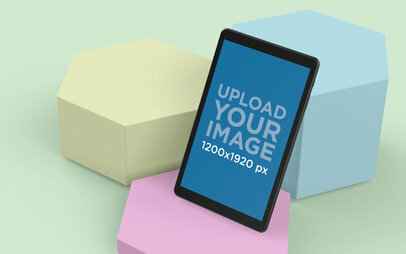 Its irregular shapes really contrast beautifully with the tablet&#8217;s hard lines.You can choose a 1920&#215;1200 px image or input a website URL in this Lenovo Yoga mockup. 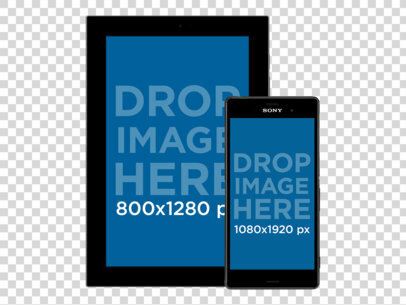 This Microsoft Windows Surface tablet mockup template shows a student in at a lecture while he’s checking his Windows Tablet in landscape position. This is a great stage for anyone showing students doing homework. The lecture is empty and the user is wearing jeans. The user is looking at the tablet at a slight angle and could be checking his homework, talking with friends or better yet, getting ready for an exam! 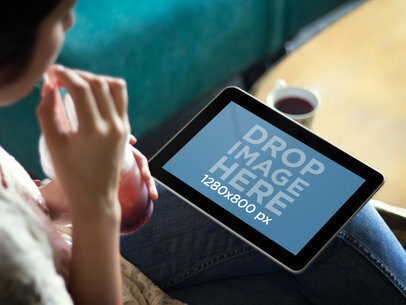 This is a wonderful tablet mockup generator in which we can see a young woman relaxing at a couch while she takes a sip out of a cold ice-tea and stares at her black Galaxy 4G in landscape position. She could be reading, streaming a music video, or even watching a complete movie! There are lots of things she could be doing with her android tablet. This Galaxy 4G mockup template is ideal for any casual app. It is especially appropriate for social, gaming or entertainment android apps, but would also fit well for any app with a casual, young audience. If you are looking for a clever way to enhance your app marketing campaign and provide more exposure to your amazing android app, try using this Galaxy 4G Mockup Template of a Woman Drinking Tea to present your new app or mobile responsive website to the world. A Lenovo Yoga silver tablet lays on a table next to a bowl of fruit and the newspaper. If your design, website, or app deals with food, or even house or home improvement, this would be the best Lenovo mock-up for you. 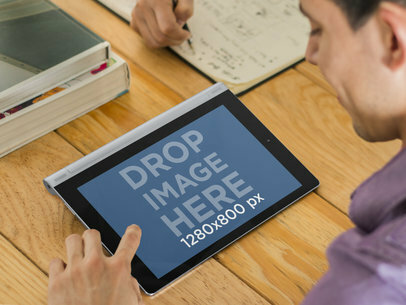 This tablet mockup features a teenager using his black windows surface tablet at school. He could be using an education app like yours to improve his learning skills and boost his academic performance. 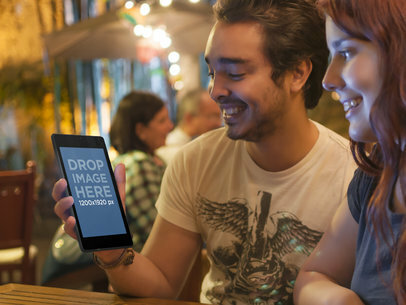 All you need to do is drop a screenshot of your app straight into the device and Placeit will deliver a compelling image you can add to your app marketing campaign. 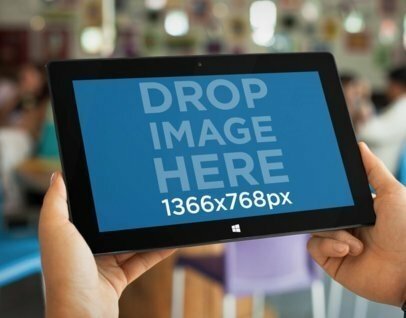 Try this windows surface tablet mockup right away! Looking for ideas to advertise your new app or website in an attractive way to prospective clients? Then, go check out Placeit's stock photos and solve your problems right away. 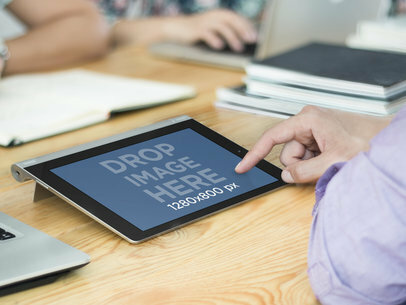 Stock photo mockups are great marketing tools because they allow you to showcase your ideas within real-life context images, allowing consumers to get a look at your app/website features. What are you waiting for? 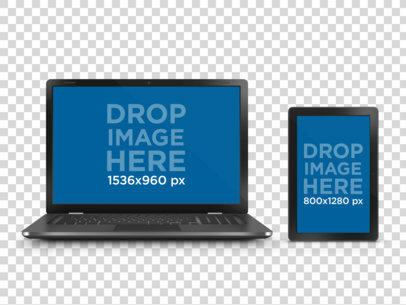 Make an impression on your consumers today by making mockups part of your marketing strategy now! 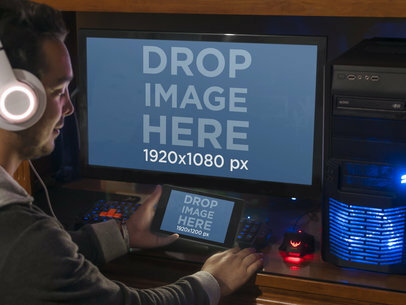 This photo mockup features a young man using a Windows Surface Tablet in landscape position. What kind of product/service are you trying to promote? Do you have an app or website that aids in productivity? Maybe your site specializes in creating presentations or graphs? Does your site help with creativity or group work? Or do you have a new social or business app, that allows people to communicate from around world? If you answered yes to any of these questions, then you need this lenovo tablet mockup from Placeit as part of your online marketing strategy. This features a group of people, sitting at a creative office table, with the main focus being the Lenovo Tablet in landscape position. The screen is angled just right, so you can easily drag a screenshot from your site and turn this mockup into a valuable marketing tool. 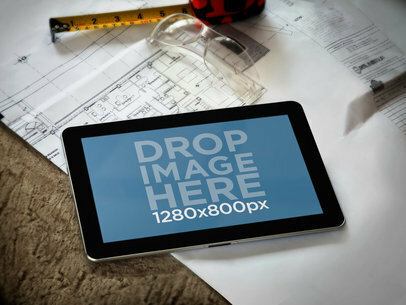 This tablet mockup template features a young man holding his black windows surface tablet in an angled landscape position. This is a great setting in which you will be able to showcase your new windows app or website. This young man is leaning on a red bar with a fresh and natural backdrop, he could be at school, a park or an ecological office. 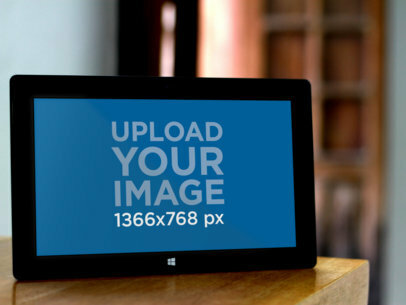 Go ahead and use this amazing windows surface mockup to display your website right away! 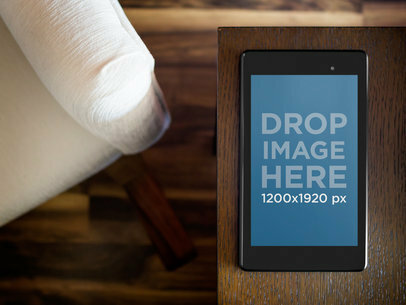 This tablet mockup is an incredible visual asset you will be able to add to your app marketing campaign to provide an insight on your app's features and design to potential clients and business partners. 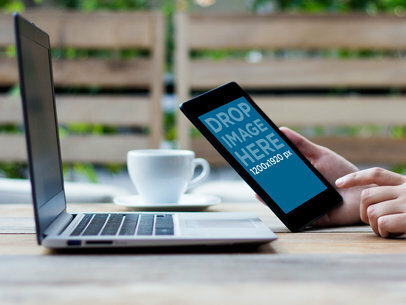 Go ahead and use this windows surface mockup template featuring a pretty lady at a local cafe, she is holding the black windows tablet in a landscape position while she browses through your app, try it out right away! Fail. This young man just dropped some delicious raspberry ice cream on his black Samsung Galaxy tablet. 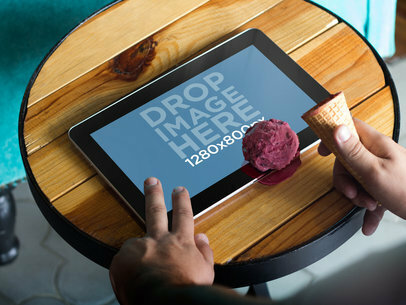 Although this scenario is unusual, the contrast between the circular purple ice cream, the circular brown table and the Samsung Galaxy tablet laying in landscape position makes for a very beautiful image in which your new android app or mobile responsive website would really stand out and steal the spotlight. 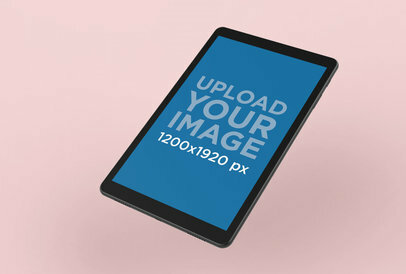 Use this tablet mockup generator to create a beautiful image that will be perfect for displaying any type of app in an original way that will allow your potential users to take a look at your fantastic features and design. 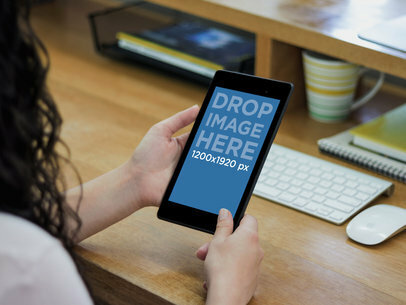 After adding your app's screenshot to this Samsung Galaxy Mockup Template at Ice Cream Parlor, you will be able to download the result image for free and use it on your fun new website. A Lenovo Yoga Silver tablet on a light brown office desk. Next to it, a business newspaper. In the back, blue chairs to brighten up the scene. 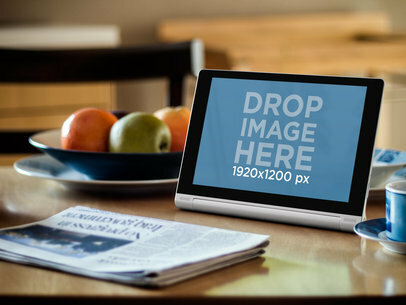 This Lenovo Yoga mockup is perfect for business apps or websites.